We rely on our experience, expertise, and depth every day, yet we never stop looking for opportunities to learn from others. Jon is a seasoned strategist and creative director who works on a range of digital and traditional marketing experiences for both B2C & B2B clients. Jon works with startups, Fortune 500 companies, internal marketing organizations, agencies, and everything in-between. Jon graduated with honors from the Academy of Art University with a degree in Advertising in 1995. Our team is comprised of a talented group of creative thinkers. They are trusted friends, and they are colleagues with whom we've worked for years. This whole “nimble & flexible network thing” has worked really well for us. If ever there is a project manager hall-of-fame, Matt will be in it. As our primary client contact, Matt ensures that deadlines are met, emails are responded to, and budgets are diligently monitored. Recently, Matt and his family live in Bend, Oregon - a state where beards are socially acceptable. Clear, concise, credible and some would say, stylish, Keven Smith writes with the deftness and cleverness that B2B clients love. 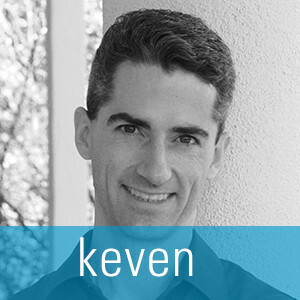 Keven has penned his proficiency for a plethora of Fortune 500 clients and is a twelfth-degree black belt in lead generation copywriting. He is also a classically trained musician and proud papa. Since 1995 Jon has worked with a wide range of clients through multiple agencies.